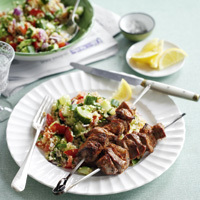 Harissa brings the warming heat of North African cooking to these tempting skewers loaded with chunks of juicy lamb. First make the taboulleh. Put the bulgar wheat, cumin, ginger and cinnamon in a dry non-stick frying pan over a medium heat and cook for 1-2 minutes. Transfer to a wide heatproof bowl and pour in enough boiling water to just cover the bulgar wheat. Cover with cling film and leave for 10 minutes or until the liquid has been absorbed. Meanwhile, put the tomatoes, cucumber, red onion and herbs in a large bowl with the lemon juice. Season well and set aside. Put the lamb into a bowl, sprinkle over the spice mix and season well. Thread the lamb on to eight metal skewers, spray with low calorie cooking spray and grill for 5 minutes on each side or until cooked to your liking. Tip the bulgar wheat into the tomato mixture, stir in with a fork and check the seasoning. Serve the harissa lamb with the taboulleh and lemon wedges to squeeze over.